Early Sports and Pop Culture History Blog: What Came First - Bozo or Bozo??? - an Etymology of Bozo. What Came First - Bozo or Bozo??? - an Etymology of Bozo. Everyone knows Bozo with his shock of orange hair. Bozo originated as a character on the Capitol Records’ read-along record, Bozo at the Circus, issued in 1946. His first first TV appearances followed in 1949. In 1956, TV visionary Larry Harmon purchased the rights to Bozo, developed a children’s show format, and sold Bozo franchises to local stations across the country. Bozo quickly became the iconic image we all know and love; his funny name likely playing some role in his success. These etymological suggestions, however, leave a disconnect between the meanings of the slave-trade usage and the modern sense of the word that emerged in the 1910s, and a disconnect between the dates of first use and purported use among slaves. While a person who does not speak Spanish well or an extremely cheap person might be considered foolish or incompetent in certain circumstances, neither poor language skills nor extreme cheapness are closely associated to the general idea of being foolish. There is no apparent explanation for how or why the word emerged when it did. Moreover, by 1910, slavery had been dead for nearly fifty years and the importation of slaves had ended more than one-hundred years earlier. If bozo had been derived from a foreign word or words introduced through the international slave trade, it seems likely that there would be examples of the word in use from before 1910. There is, however, an alternate candidate for the source of Bozo that has apparently not been considered before. The new candidate is closer in meaning to the modern sense of the word than the proposed Spanish or Gullah origins and closer in time to the reputed dates of first use. The origin of the word bozo may not even be an earlier word. The word bozo may derive from the name Bozo, the name of a comic character from vaudeville and burlesque and the stage name of one of the actors who portrayed Bozo, Tommy “Bozo” Snyder, a Ringling-Brothers-trained, circus clown. That’s right – Bozo the Clown may be derived from bozo which, in turn, may have been derived (at least in part) from the stage name of a former clown. The actress persuades Spike Hennessey, “to take the part of [her] father so as to help her win the hand of a bogus English Lord, who is supposed to have plenty of money in addition to his title. The fun comes from the transformation of an uncouth laborer into a society gentleman in a dress suit.” Evening Star (Washington DC), January 30, 1900. 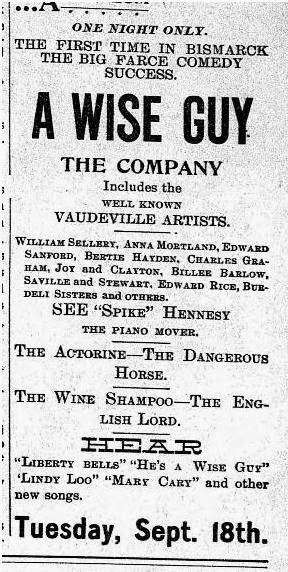 Wise Guy also featured, “[n]ew songs, music, dances and specialties, as well as a bevy of pretty choristers.” Evening Star, January 27, 1900. Edmond Hayes became famous for his role as "the original wise guy," Spike Hennessey. He played the role every year for ten years. In 1909, however, he took a break from the role, starring in the baseball-themed show, Umpire. In 1910, Hayes returned to the role of Spike Hennessey, but this time in a spin-off entitled, The Wise Guy in Society, which appears to have been written by Hayes, eager to capitalize on his previous success as Spike Hennessey. The Wise Guy in Society featured Spike Hennessey and his sidekick, Bozo, as a team of working-class piano movers dealing with high-society types in humorous, culture-clash situations. The brief descriptions of both A Wise Guy and A Wise Guy in Society make it difficult to determine how similar the later show was to the earlier show, or whether the second show was, perhaps, merely a repackaged version of the original show. Although the sidekick, Bozo, is not mentioned in descriptions, A Wise Guy, at least one report of the show describes it as featuring more than one piano mover. It is therefore not clear whether Bozo originated in George M. Cohan's original sketch in 1899 or with Hayes' spin-off in 1910. In any case, Bozo originated at least as early as 1910, the same year given as the date of first use of the word 'bozo' by etemonline.com. Gayety, frivolity, hilarity, and high jingles are promised this week at the Lyceum, where Edmond Hayes, the original “Wise Guy” will pay a visit. The Washington Times (Washington DC), February 26, 1911. A similar notice appeared in The Appeal (St. Paul, Minnesota) on April 22, 1911. Edmond Hayes and Robert Archer, under the employers’ liability act, should be retired (a long time from now) on a pension. Edmond Hayes deserves, I can’t think how much, per week, and Robert Archer merits nearly as much. Hayes has a “shade on him” because he wrote the sketch (“satire” it is called on the program) that turned yesterday’s audience at the Orpheum into a shrieking, hysterical, happy crowd. . . .
What is “The Piano Movers” about? About moving a piano, of course. The superintendent bosses the job and his crew of workmen is an undersized “gent” with an expansive grin and a like disposition to wrestle with a can of beer when he isn’t struggling with an upright. The piano falls on him finally. I have never heard that a fallen piano is a conductor of mirth, and a pinioned mover, squirming beneath it while his superintendent earnestly speculates on the best way of getting him out, is a spectacle to draw the ultimate shriek of glee from sane human beings, but I admit that in the case of “The Piano Movers” both these miracles in mirth were performed. Enter complaint against yourself if you miss Hayes and Archer when they move a piano. The San Francisco Call, September 2, 1912. The Times Dispatch (Richmond, Virginia), February 8, 1914. One indication of the success of The Piano Movers, and the character of Bozo, is that Robert Archer, who had originated the role, featured that fact prominently in advertisements for his unrelated show, The Janitor, in 1915. The Washington Herald (Washington DC), November 18, 1915. Barney Gerard’s “Some Show” is the current attraction at the Gayety Theater. The company is headed by Edmond Hayes, creator of “the wise guy” and “the piano mover,” who returns to burlesque after an absence of six years in vaudeville. It is in the latter character that Hayes appears in the present production . . . . Accompanied by his faithful “Bozo,” impersonated by Thomas Snyder, he appears in the character of a bogus lord in order to discourage the ambitions of a title hunter. Many humorous situations come as a result. . . . The supporting cast includes . . . a carefully selected beauty chorus of twenty girls. The Washington Times, March 25, 1917. Gayety Comedian Started Life in Quick Lunch Emporium. Bozo – no one can explain the name for you’ll have to go to see the “piano mover” in Barney Gerard’s “Some Show” to understand it all. But here’s a little history of the side-splitting comedy side-kicker of Edmund Hayes, who is playing in a pantomimic role at the Gayety all this week. Bozo – or Thomas Snyder as he was then, left home when but a little bit of a shaver an odd dozen years old – and landed in Chicago dead broke. Work in a restaurant kept him living, barely living – until Ringling Brothers Circus came along. The noisy slapstick artists attracted young Snyder more than did running orders of “ham-an’” and he joined the circus as a clown. Traveled with it six years, too, alternating between the circus ring in summer and the restaurant in winter. A trip to the Colonial Theater – a tryout of the lines – and Bozo was created. And since then, thousands of burlesque fans have been delighted and convulsed by the actions of the “silent man” playing opposite to Edmund Hayes – Thomas Snyder – alias Bozo. 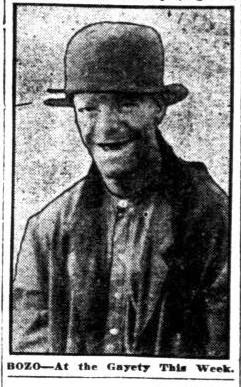 The Washington Herald, February 28, 1918. The comment, "no one can describe the name," suggests that the word bozo did not pre-date the character; if the word existed independently from the character, one might explain the name with a cheap pun. 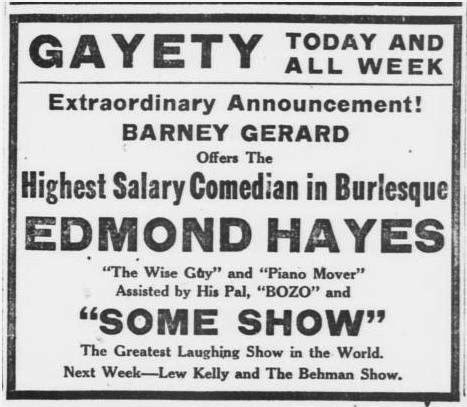 Bozo Snyder was so successful in the role of Bozo that he would return to Gerard’s Some Show in 1920, but this time as the headliner, without Hayes. Hayes had moved on to a new show, The Night Owls. But even Hayes, the erstwhile “highest salary comedian in burlesque” would not leave Bozo behind completely. 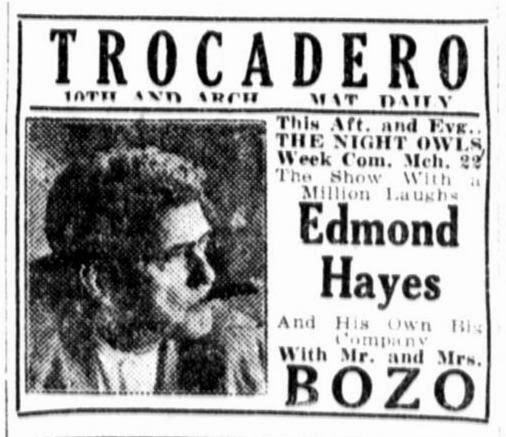 An advertisement for The Night Owls, touted, “Edmond Hayes, And His Own Big Company, With Mr. and Mrs. BOZO,” with the word Bozo set apart in large font, the same size font as his own name and the name of the theater. The Evening Public Ledger (Philadelphia), March 20, 1920. “Bevo” Snyder is the appellation under which Tommy Snyder, hitherto known as “Bozo,” desires to be known. He is to be the featured comedian next season with Barney Gerard’s “Some Show” on the American Wheel. Snyder is under contract to Gerard for five years and, due to the fact that several other comedians are known as “Bozo,” it was seen fit to change Snyder’s name. The New York Clipper, June 18, 1919, page 21. The name Bevo was borrowed from the Anheuser-Busch company’s prohibition-era non-alcoholic malt beverage. What a bozo – changing his name was probably one of the most foolish and incompetent decision he could make. He realized his mistake, however. Advertisements for Some Show less than three weeks later list him as “Bozo” Snyder. The Evening World (New York), February 9, 1920. Burlesque Comedian Signs Contract Effective at End of Present Season. 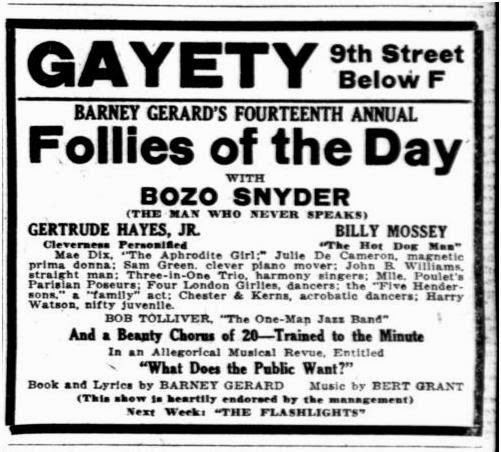 Tommy Snyder, better known as “Bozo” to the followers of burlesque, and who is featured comedian with the “Follies of the Day” at the Gayety this week, will soon leave the fields of burlesque for that of comedy pictures. “Bozo” has had several offers relative to an appearance in the comedy line of the cinemas and has each time, refused them. Through his manager, Barney Gerard, Snyder was enticed to sign a contract that calls for his appearance on the movie lots immediately after the close of the current burlesque season. For eight years Snyder has delighted burlesque patrons with his comedy and during the last four years he has worked the comedy part of the show in pantomime. He is known as the “man who never speaks.” Aside from that he has a reputation of having the most grotesque and true-to-life tramp make-up ever used by any comedian using the tramp character. The Washington Herald, September 29, 1921. I was unable to find out what happened to Snyder’s movie career, but the difficulty of finding information suggests that it did not go well. However, the character of Bozo may have appeared on film in Mary Astor's 1926 movie, The Wise Guy. The plot is not directly related to the plot of Cohan's The Wise Guy or Hayes' A Wise Guy in Society. It does, however, involve a troupe of vaudevillians, one of whom is listed in the cast, as "The Bozo." 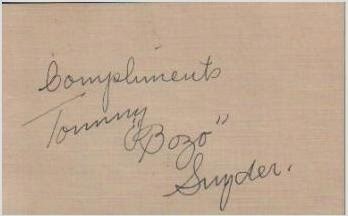 Tommy "Bozo" Snyder performed with Follies of the Day at least into into 1922 and continued performing as Tommy "Bozo" Snyder into the 1950s. He also made the leap from vaudeville and burlesque to Broadway. In 1928, the New York Times reported that the comedian about whom, "[t]hose who go to the burlesque shows have been screaming this long time about . . . "Bozo"--yes, "Bozo"--Snyder," was "on Broadway at last." December 2, 1928. "Bozo" Snyder later played the "second paperhanger" and the "2nd Rube" in Michael Todd's Peep Show, a girlie revue that played 278 performances at the Winter Garden Theater from June 1950 through February 1951 (Michael Todd later developed the Todd AO 70 mm film process). The Sydney Morning Herald (Australia), May 4, 1939. Acknowledged by Charles Chaplin to be the pantomimic comedy genius of the age. The Sydney Morning Herald, May 6, 1939. 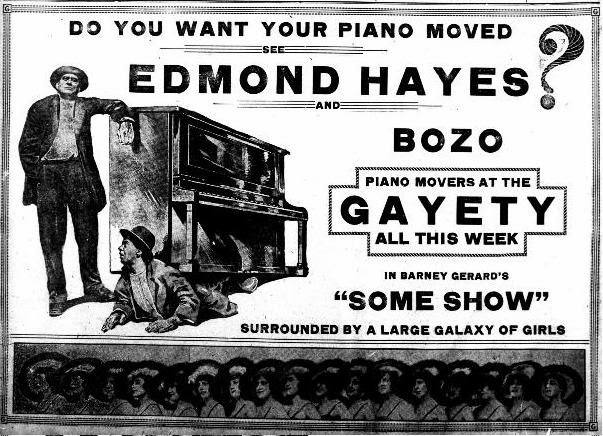 Hayes’ and Snyder’s success and long tenure in their roles as the hapless piano movers could well have sparked the use of bozo as a word meaning foolish or incompetent person. The first recorded mention of Bozo in print was in February 1911, mere weeks after the earliest, purported earliest date of use of 1910 and five years before Merriam Webster’s earliest date of first of 1916. Bozo seems to have been foolish and/or incompetent, consistent with the modern sense of the word bozo. Both the timeline and character of Bozo are in near perfect agreement with the modern sense of bozo and the dates of first use. Here comes a slugger to the bat; wow, Say that bozo murdered that. The second day of the hearing ended in a riot five minutes after court convened, when the prisoner, Garret Whoozus McKenna, rose in court and presented Judge Bozo with a nice, red apple. The Washington Times, May 21, 1922. The word was well-established by 1931, when both Laurel and Hardy and the Marx Brothers used the word bozo in separate films. In One Good Turn, near the end of the film, Laurel yells at Hardy, "Come out of there, you big bozo! "” In 1932, Laurel and Hardy would star in Hal Roach’s Academy Award-winning comedy classic, The Music Box. The Music Box is a story about two tramp-like piano movers, a bossy one and one who doesn’t talk so much, moving a piano into the home of a high-society couple; a piano falls on top of one of the movers and the cast includes a dangerous horse. While it is impossible to know how closely Laurel and Hardy’s piano-moving difficulties compare with Spike and Bozo’s piano-moving problems, the similarity is intriguing. The Marx Brothers had been direct competitors of Bozo Snyder in burlesque. 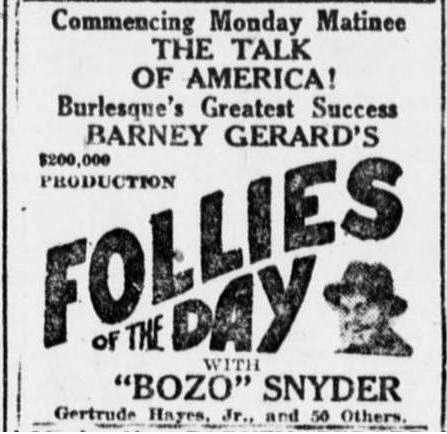 A 1919 advertisement for Barney Gerard’s Follies of the Day, which Bozo Snyder would join in 1920, ran directly beneath an advertisement for the 4 Marx Brothers. Clearly, the Marx Brothers were in a perfect position to have been familiar with Bozo. Which came first – Bozo or bozo? The fact that a character and an actor named Bozo both originated at precisely the same time that the word bozo is believed to have taken root is not necessarily proof that Bozo begat bozo. Hayes (or Cohan) might just as easily played off the meaning of the new word in selecting a name for thier foolish or incompetent character. This begs the question, which came first, Bozo or bozo? As discussed above, it seems that if bozo had been in use prior to 1910, there would be examples of the word in use. Of course, if Hayes (or Cohan) had chosen the name for specific comic effect when the word was new, it might be difficult to prove otherwise. However, I am inclined to believe that the Character spawned the word. The name Bozo is a traditional Serbo-Croatian name from the Balkan region of Europe. Serbians and Croatians migrated to the United States in large numbers during the great migration from 1880 through 1914. The largest concentration of Serbians and Croations in the United States is in Pennsylvania, concentrated in the mining and steel towns of Western Pennsylvania. Perhaps not so coincidentally, Tommy "Bozo" Snyder, whose real name was Thomas Bleistein, was from Bedford Pennsylvania which is located in southwestern Pennsylvania, about half-way between Harrisburg and Pittsburgh. Was it a whim of fate that the dream of empire for the Serbs, so nearly realized by Prince Stephen Duchan six centuries ago should be fulfilled by his lineal descendant Bozo Gupevic of 1845 Sacramento Street, San Francisco, in this year of our Lord 1909? San Francisco Call January 19, 1909. Bozo, who had married well (he inherited $1,000,000 after the death of his first wife) had lived in the United States from a young age to avoid assassination. He was not completely safe in the US, however; his brother was poisoned in an assassination attempt in Colorado. World War I would break out a few years later when Archduke Ferdinand was assassinated in Sarajevo, Serbia. It was a dangerous time to be Serbian royalty. I do not suggest that the Bozo was named after the heir to the throne of Serbia, but that Bozo was a known, common (or at least not completely uncommon) name among an ethnic group from a recent wave of immigration. A person named Bozo might have been expected to work as a piano mover under the direction of an Irishman (Hennessey) from an earlier wave of immigration. That the name Bozo may have sounded at least nominally funny to American audiences may have clinched the choice of the name. Without more convincing evidence of the use of bozo to mean foolish or incompetent before 1910, the choice of the name Bozo as a character name seems more likely to have been based on the name than on the pre-existing word, bozo. The word bozo and its meaning would then have been derived from the character Bozo. Which is more believable, that a one-hundred year old or older Gullah or Spanish word for either cheap or a poor Spanish speaker would emerge in the pop-culture of the 1910s as a word for a foolish or incompetent person, or that the name of a famously foolish and incompetent character from the early 1910s (if not earlier) would emerge in the pop-culture of the 1910s as a word for a foolish or incompetent person? That was a rhetorical question. We may never know for sure. It was the clarinet that got Pinto into show business when he was 12. . . . Pinto told the man he could play "squeaky" clarinet and ran back to the hotel to get his instrument. He was hired on the spot and given some oversized old clothes and a derby and, for the first time, white makeup and a clown face. The man told Pinto, "Now you look like a real bozo" ("bozo" was a name given to hobo or tramp clowns in those days). The date of the story pre-dates the first recorded report of Bozo in Wise Guys in Society by five years. However, it is not clear when Pinto Colvig told the story, or whether it actually happened when he says it happened. Perhaps he was called a 'bozo' at some later time, and conflated the two events in retelling the story years later. Perhaps the Bozo character had actually been performed in the earlier productions of Wise Guy before 1905, although not mentioned in print until 1911. Colvig is said to have performed in vaudeville in the 1910s and joined a circus band in 1916, which places him in vaudeville at the precise time that Bozo was becoming famous in vaudeville. If it were true that 'bozo' had already been an established generic term for tramp clown, one might expect there to be better evidence of use prior to 1910. One source written late in Bozo Snyder's career, but before the creation of Bozo the Clown, specifically identifies "Bozo" Snyder as the origin of the word "bozo," meaning a tramp clown, which if true would discredit some of the details in Pinto Colvig's story. The writer Dayton Stoddart credited Sime Silverman, the founder of the entertainment industry magazine, Variety, with popularizing the word Bozo, among other theatrical slang terms that had previously been confined to the limited cirle of show-biz folk; those terms included, for example, upstage (hog a scene), hoofer (dancer), kibitzer (fellow ready with free advice), burn (to be angry) and "Bozo (tramp, from Bozo Snyder)." Lord Broadway: Variety's Sime, Wilfred Funk (New York) 1941, page 270-271. The book also reflects the use of the word "bozo" as a jocular form of address conversationally among friends ("'lo bozo;" "'owza bozo? ;" "watcha mean, bozo?"). Those conversations all appear to have take place after 1918. All of the evidence seems to support the theory that the widespread fame of the character "Bozo" and Tommy "Bozo" Snyder, who famously played the character, is the source of the word, "bozo," meaning a foolish or incompetent person. The character Bozo dates from 1910, the earliest reputed date of first use for the word "bozo." The character "Bozo" was performed widely every year from 1910 through 1916, Merriam-Webster's date of first use. The originator of Bozo the Clown admitted that he borrowed the name from an old show-business term for tramp clown, and an independent source (written years before Colvig created his Bozo character) credited "Bozo" Snyder as the original source for that show-business term. Given the lack of evidence of other pre-1910 use and no apparent connection between the Spanish "bozal" or the Gullah word "bozo," it seems likely that the name of the character was chosen from the known, Serbian or Croatian name, and not based on earlier words that were not, first-and-foremost, names. An anecdote told by another early comic actor, however, would push the first use of the word 'bozo' even further back in time. In his memoir, Twinkle Little Star (1939), the comic actor, James T. Powers, who popularized the character on whom the image of Alfred E. Neuman was based, quotes an American speaking in an exaggerated English accent in the mid-1880s as having said, "Knock his blasted 'ead off! Shoot the bloomin' bozo at daybreak!" If his recollections from fifty years after the fact are accurate, it would set my entire theory on its head. It is easy to imagine, however (as it is with Colvig), that his 1930s recollections of an 1880s incident may have paraphrased the 1880s dialogue using 1930s jargon. 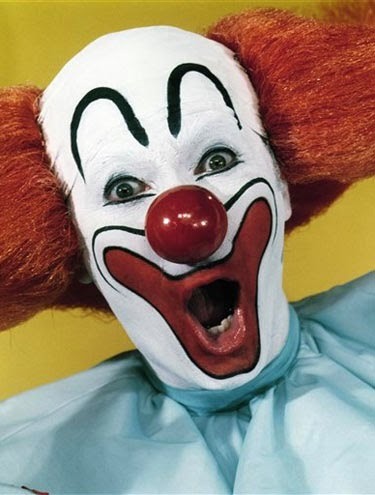 I, for one, am happy to credit Edmond Hayes and Tommy “Bozo” Snyder with creating the original Bozo character and launching the word 'bozo' in the English language. More Fun than a Barrel of Monkeys!! !